Parenting with Perspective is a blog series featuring working Seattle mothers, highlighting the way their career, personal interests and experiences, extended family, spiritual practices, fostering, gender, and culture shape the lives of their families. The aim of the series is to feature local parents and build a community, but also, in a very very modest way, to do that without portraying mothers as single-mindedly focused on constituting themselves as a certain one kind of person (as social media often seems to do). I focus largely on parents who are either running their own business or work in academia because juggling parenting and work when there are no clear boundaries imposed by fixed work schedules is familiar to me. In the future, this might change. I’ve been following Lauren’s blog for a while and have cooked quite a few delicious recipes she’s developed. I met with her family for an outdoor session in Capitol Hill. It was raining and chilly, but this glowing mama was unfazed and did not mind taking a two month old to two different locations and switching plans last minute. 1. You are a nutrition and hormone health coach, recipe developer and a blogger. Tell me a little about how you got here. Growing up, I was always petite and ate whatever I wanted, never thinking twice about it. I was a voracious eater and grew up in a family that loved to cook and eat well, and I also had a big sweet tooth. I was a late bloomer and didn’t hit puberty until I was 16, and when I did my body morphed overnight. All of a sudden I had the curves I’d always coveted, and that included a few extra pounds. It was the first time in my life I ever correlated that what I ate had a direct effect on my weight and how I looked, and from that point on I became obsessed with dieting as a way to “control” my body and appearance. For the next 10 years I tried a plethora of diets and developed weird food rules I had to abide by in order to feel good about myself. For many years I was focused on calorie-counting and eating low calorie foods, which included a ton of processed foods like protein bars, cereal, low-fat yogurts, lean cuisines and fat-free jello and cool-whip. I was able to lose weight but as you can imagine I felt absolutely terrible -- my digestion was completely out of whack, I was always bloated, getting migraines constantly, didn’t sleep well, stopped menstruating regularly, my hair thinned and my skin broke out. After years of these symptoms (and urging from my mom) I came to a point where I was fed up with feeling like crap and ready to make a change. I cut out inflammatory foods such as gluten, dairy, refined sugar and processed foods and began cooking at home for the first time in my life. At first this was intimidating since I was used to microwaving all of my meals (and knowing exactly how many calories and grams of fat were in everything) but I began to truly enjoy cooking. It was a way for me to de-stress, be present, use my hands and nourish my body (and the bodies of those I loved). This new passion inspired me to launch So Fresh N So Green in 2012, which started out as a recipe blog. I also began to feel so much better, thanks to the switch to eating real, whole foods (including TONS of plants). My digestive issues dissipated, my hair became thick and full, I was back on a normal menstrual cycle and I had so much more energy, mental clarity and focus. I discovered how good it felt to take care of myself and prioritize my health (physically, mentally and emotionally) and I wanted to empower others to do the same, as I knew the positive impact it could have on a person and everyone around them. So I enrolled in the Institute For Integrative Nutrition to become a certified Nutrition + Hormone Health Coach, went to business school, and officially launched my nutrition and healthy lifestyle coaching business, So Fresh N So Green in 2016. 2. How has work changed for you since becoming a mom recently? 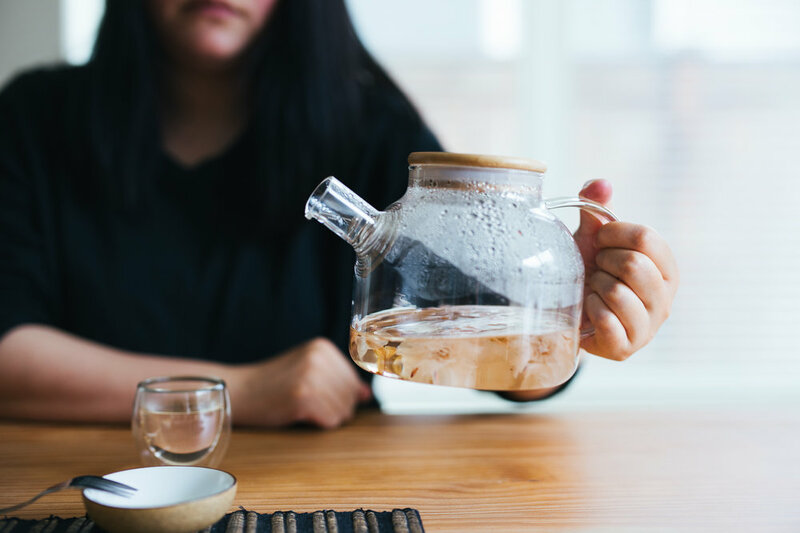 It’s all progressed rather naturally, as before I even became pregnant I started noticing many symptoms in my clients that were reaching beyond food and tied to hormonal health. What you eat is one of the most impactful ways to balance your hormones, but hormone imbalances, symptoms and causes are complicated and I wanted to have a deeper level of understanding in order to better support clients. I went back to school to become accredited in hormone health, and this was right around the time my husband and I decided we wanted to expand our family. Hormones are essential to have a baby (it’s impossible to have one without) and I learned so much in regards to fertility. We were lucky to get pregnant soon after, and I do think having this knowledge and living a healthy lifestyle was really helpful for us. I see a lot of people struggling with fertility, and not only does the CDC report currently that 3 out of 10 women have fertility issues, but they expect it to increase to 7 out 10 in the next 10 years. This is really upsetting, and while there’s more and more awareness developing on the topic, I think people are just on the cusp of learning how many things in our everyday environment are tied to fertility and hormone health. EMF radiation, high-stress lifestyles, toxins in our food, makeup, skincare, furniture, water, cleaning supplies, air, etc. are all contributing to hormone imbalances and symptoms such as infertility, weight gain or drastic weight loss, autoimmune conditions, food intolerances, digestive issues, hair loss, degenerative diseases, etc. So I feel it’s really important to help my clients navigate through these often times unknown or diagnosed symptoms to help them feel their best. 3. Both you and your partner work from home, and seems that you have continued working with a newborn. How do you manage that? I’m honestly taking it one day at a time and learning as I go. I do know time is as precious as it’s ever been for me now that I have a newborn, so I am being very selective about who I choose to work with. I feel really lucky that my husband is also an entrepreneur (he works in real estate) and mostly operates out of our home office. This makes it MUCH easier to switch off duties or run an errand during the weekdays, however his schedule is often unpredictable so we have to take that into account as well. I think communication here is paramount, and we’re learning how to do it better. 4. What are some health insights that you have as a nutrition and hormone health coach and that you personally found helpful you during pregnancy and postpartum? First and foremost, set everyone else’s advice aside and do what YOU feel is right for you (I realize the irony in this statement but couldn’t help myself). People just love to give unsolicited advice, ESPECIALLY on the topic of pregnancy and parenting. Everyone is so different and are going through their own unique experiences, so what worked for somebody else might not work for you -- and that’s totally OK. Listen to your intuition and consult a licensed medical practitioner (i.e. avoid Dr. Google). I also think self-awareness is a key aspect in leading an overall healthy, happy life (and that goes for pregnancy and postpartum as well). Knowing how you operate, what you need to thrive, what lights you up inside and what drains you of energy is key to living your life in a way that empowers you to feel your best. For me I knew it was super important throughout pregnancy and postpartum to nourish myself with healthy meals, drink lots of water, remain active and exercise (I hiked all the way into my last month of pregnancy!) and prioritize sleep. I spent time with people and took on work projects that brought me great joy, and I said no to the things that were total energy or time-suckers. If you can take a bit of time before pregnancy (really any time in your life works though) to get really clear on what you want to invite more of into your life, what you want to let go of, and what you need to truly thrive it will help you be more intentional throughout the process. 5. What are your favorite work spots around Seattle? If you’d like to schedule your urban newborn session in or around Seattle or be featured on the blog, get in touch! Every year I photograph our children, and my husband designs New Years cards for us. It’s something I look forward to because it is truly a whole family affair. I can’t say that it is relaxing though. Photographing my children in a planned 40 min to an hour session is much harder than my most difficult family sessions. I think about this every year- how my experience taking photos of them is a great testament to why you should hire a professional family photographer. Well, aside from the most obvious issue with skill, of course. My kids know all my tricks and are not impressed by the ways I try to bring their attention to certain places in order to keep them all around the same area. My clients’ children (unless they are newborn) are never that ambivalent about the stranger with the clicking camera. Photographing children alongside parents is also helpful because it helps the kids (and the adults) relax and focus on their mutual interaction instead of me. Parents in family sessions serve as anchors, helping divert kids’ attention or making them walk in a certain direction. Despite this lack of credibility I seem to have with my own kids, with A LOT of effort the images taken at Golden Gardens this year turned out pretty well. And I love that they remind me of the struggle to keep my 17 month old from running after dogs (he is crazy about them!) or his siblings, and to keep my 3 year old from posing for me. They capture the chaos and the sillies pretty well. So I thought I’d share a few. Of course, we let the baby finally get that dog (see last image). Get in touch if you'd like to be featured! Bryony is a birder and a writer on a mission. She writes about birding, conservation, gender and fashion. And if you never thought these things were related, or never considered yourself a birder, you must read her blog. It is likely to change the way you think about birding. Tell me a little about your background. What inspired you to become a birder? I’m a born and raised Pacific Northwest girl. I grew up in an artistic and environmentally conscious household with an artist/ornithologist dad and reproductive right activist mom. And one thing our family all did together was go birding (or bird watching). In an annual tradition, every New Year’s day we’d drive up to the Skagit Valley to count migrant swans and geese, watch eagles catch spawning salmon along the Skagit River, and tailgate picnic with family friends. Over the years my sister and I got to invite girlfriends to join these family day trips, and the joy of sharing a day outside with birds just grew and grew. You write about birding in an effort to make it cool and accessible. Historically, what does a typical birder look like? Is it a white male? What else do you strive to achieve with your writing? Yes, I want to popularize birding among women who might otherwise be discouraged by the image of the older white person with expensive optics and a competitive and stridently scientific (and humorless) attitude. Birding has an image problem, especially among people of color and younger birders. There’s a stereotype that you have to know a lot about birds already in order to call yourself a birder, and that you have to keep a life list for species seen and afford exotic trips to birding hotspots to be legitimate. I hope to establish a new archetype of birder, someone who birds on her terms, whether by watching a backyard feeder, birding in her city, taking trips, doing it alone or with friends, taking joy in common birds as much as uncommon birds. Birding is a sensory experience, and a way to fully engage with your surroundings, wherever you are. I am convinced that once a woman taps into paying attention, she’ll be hooked and never “not be birding.” That is my experience. I walk to work and hear birdsong through the layers of city noise. Aside from this, my larger goal is to bring awareness to the importance of wild bird conservation. My hope is that by noticing birds, people will care about preserving them. Do you have a community of women birders locally? Yes, but I wish I got out more with them! My sister and I lead annual birding trips in the winter, to the Skagit (our old stomping grounds), and I host a Facebook group called Birds Who Bird. The Facebook group is international, but many of the members are local to Seattle just because that is the critical mass of who’s been invited to join. I see more of my birding friends at Seattle Audubon events than I do out birding. I am a long time member of Seattle Audubon, as well as current board member. I support their mission of strengthening awareness of urban birds and building partnerships with other city environmental and social justice groups as a way to make birding more inclusive. Many of my women birding buddies are people I have met through Seattle Audubon. But I am constantly expanding on and building this community. I engage new friends who arent birders, and now they are birder friends, too! And I even met one of my birding buddies when I heard her on the radio talking about being a woman of color birder and wanting to redefine the narrative of who gets to be a birder. I fangirled her on Facebook and now we’ve gone birding together twice! How have your birding and writing practices changed since becoming a parent? I became a parent 8 years ago with my son, Vireo (named for a bird! ), and started writing professionally when he was two years old. I suddenly felt this urgency to make a difference in my own words, as the future for my kid depends on me and others like me--saying something. I knew the best angle I had was my love of the outdoors and nature, and birds are what I know best. And guess what my first published story was about? Backyard birding with kids! At the time I tried a bunch of genres once I got my writing voice going: I wrote a lot about healthcare and childhood development and exploring parks with children. But I kept coming back to birds. I am not a science writer, and was instead interested in writing about the people who were interested in the birds, rather than the birds themselves. So three years ago I focused on writing about birding culture and appealing to women specifically. That is when I started my blog, sharing original content and published stories having to do with popularizing birding and showcasing women who work with wild birds as vocation or recreation. My daughter Vesper’s arrival in 2017 hasn’t changed my focus, but it has limited my time to write. My blog is now mostly Q&As, as these are quick to produce, and the limited writing I do outside of that is for pay. I used to blog for Seattle Audubon as a volunteer, but had to scale that back. What are some creative ways in which you combine your passion with parenting. How do you keep up with your skills? This is such a great question! I was a guest on the American Birding Podcast talking about how to bird when you have kids in tow. The long and short of it is that to bring my kiddos along birding, I have to make it more about them than what I hope to see that day. There absolutely has to be a draw for the kid outside of the birds or the hike. It helps if they can bring a friend along, or if there is some other distraction, like hunters and bird-dogs, such as you see in the Skagit. As for keeping up my skills, I mostly now bird in the city, so am getting to know common city birds more intimately since that is what I have time for at the moment. I have the Sibley Birding app on my phone and use it to confirm what I’ve seen or heard. I’m trying to improve my birding by ear right now. The other thing I do to keep up my skills is go out with birders who are more skilled than I am. I only know up to a certain point, and am aware of where I can improve in identification and bird behavior. You love fashion and good design and you have made comments alluding to the way that we see outdoors culture and design (or fashion) sense as exclusive. This resonates a lot with some of my favorite social theory. Tell me more. What are your favorite pieces you like to wear when you bird? Yes, I love to present well, to represent! In some birding conversations, women in particular say with a sort of pride that they do not care about fashion. But why not? Is that shameful or frivolous to care about fashion? My theory is this: because birding is historically an older, wealthier white man’s pastime, any woman who showed up was going to be at best, discounted and at worst, objectified. And especially if she wore something conventionally feminine or attractive to the male gaze. So birding fashion, if you can call it that, has become sexless. And birding remains that way to this day. Hiking, skiing and other outdoor apparel is now overtly and proudly varied from super femme to unisex, but in birding, it seems like any suggestion of prettiness is verboten. I firmly believe that we should showcase our best plumage when birding--the birds do it for us, we ought to do it for them. That’s my justification for having fun with what I wear when in the field. My favorite “uniform” is a fedora, tight pants, wool coat and galoshes. Well, I am at work on a book! The book has an interested publisher and it is about women in the North American birding scene, and how to get into birding. The target audience is, surprise! Urban and suburban women. Writing a book is all consuming, and I have to block out anything that does not have to do with this project, unless it is family or day job. I do not have birding trips planned, simply for lack of time. I want to use that weekend time to write! I know once this book is published that I will resume leading field trips and I would love to speak at bird festivals and continue writing articles about birding culture wherever I can find a home for such content. I already have another book idea in mind, too, after this one! 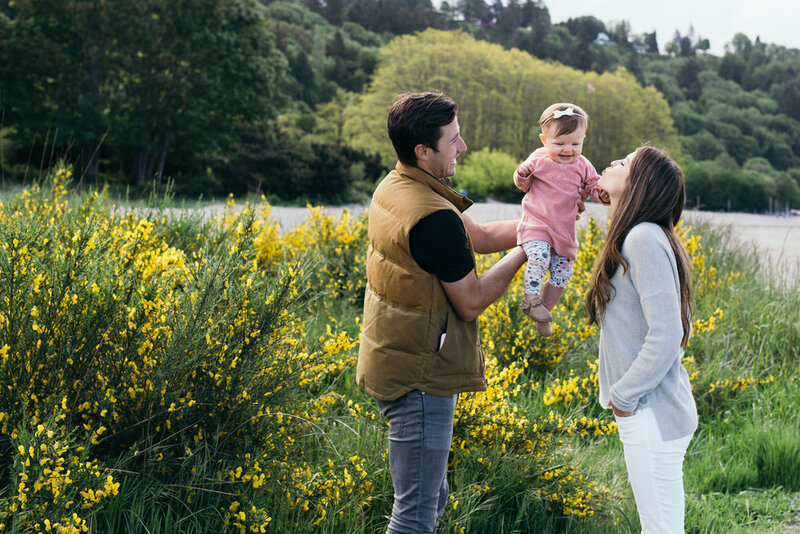 To book a lifestyle family session in one of Seattle parks, get in touch. I met Rachel at her home on a weekday after work / school. The boys were playing music and making a peach crisp to take to a block party as we chatted about their impending travel to Europe and Israel and raising bicultural / bilingual kids. My husband Lev and I have three boys, J aged 11, E aged 8, and N aged 3. Lev is a physician-scientist specializing in hematology, and I am a historian specializing in fashion, dress, and textiles in early modern China. Work-life balance is tricky. Actually I think academia can be a great job for parents in being flexible. 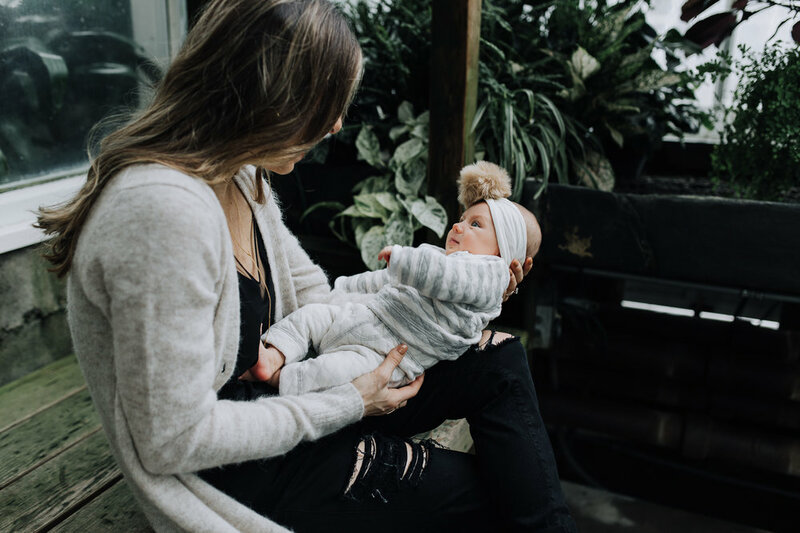 That flexibility was especially helpful in the baby stage – my first child was born just before I entered the PhD program at Oxford, my second halfway through the program, and had my third just after starting my first teaching job. Spreading them out like that worked well for us. The most difficult aspect of being an academic when the kids were young was the travel – the conferences and especially research travel. It was really tough to take a month or even a couple of weeks to travel to China when the boys were infants and toddlers. I would love to take the kids to China, and you could definitely do that with one or even two, but three is a little challenging! And actually that is still a challenge – the ideal academic is someone with no responsibilities or family ties – whether that is an elderly parent, or a young child - to look after, which is why there are so many child-less / child-free women in the academy. Of course three children is a lot of work. But a large chunk of the challenge is just time management and organization, which I find quite easy. For me what was critical was protecting the morning time when my brain works best for research and writing and tasks that actually take really focused thinking. In the evening after the boys would go to bed, I would do less onerous tasks like formatting or bibliography or marking or emailing. The down-side to that is there is no clear boundaries between work and home, but I guess many people’s lives are like that now – flexible work is both enabling and restricting. I think it is hard to avoid feeling like you make compromises. I love being with my children, and I love my work, and both are infinite. As a mother, you could always be doing more playing, or reading, or going on excursions with your children. And as an academic, you could always be doing more research, or writing, or prepping lectures. The 21st century “perfect” mother is someone who is super-involved with her children’s lives and interests. She has a successful career, but she can still ferry her children around sports and after-school activities, AND make Instagram-worthy packed lunches every day. It is laughable but these kind of social norms surround us in insidious ways and it is hard to put them aside and find your own way of mothering. But I get enormous joy and satisfaction from being a mother, and after 11 years, I have a thicker skin regarding the pressure towards perfectionism in either realm – I don’t believe that women can have it all, any more than men can. Extended family seems very important to you. How do you maintain those connections? We relocated to the USA for Lev’s work, first for several years in Boston, and since last year, here in Seattle. So we are far from our parents, siblings, nieces and nephews in the United Kingdom and Israel. This is a big challenge for us and definitely the biggest drawback to living abroad. We are close to our family, and highly value the relationships the boys have with their grandparents, uncles and aunts, and cousins. So like many people, we spent a lot of time messaging and speaking on Skype, Facetime, and Whats-app. And all our disposable income goes on flights, so that we get to see our families at least once a year! For example, this summer, we went to Turkey for a close relative’s wedding, and then onto Israel where the older two boys did camp with their cousins, while Lev did some work trips in Europe, and I got some work on the book done in London while my parents looked after our youngest. That itinerary was unusual in involving so many different countries, but our priority is to allow the boys to spend a good chunk of the summer with their family. That means they flew as unaccompanied minors and did a camp in a foreign language, neither of which is ideal or easy, but the family time makes those challenges worthwhile. How has raising kids bilingual worked in your family? Lev is a native Russian speaker, he grew up in Siberia, and emigrated to the UK in his early 20s. His brother and sister-in-law speak English fluently, but his parents don’t, so we always knew that our boys would need to speak Russian to be able to have a relationship with their grandparents. We raised the boys bilingual by having Lev only speak Russian to them, and me only speak English to them. I studied a little Russian, and though it is getting a little rusty (taking lessons again is on my to-do-list! ), I can understand enough so that our family conversations can go back and forth between the two languages. There were challenges in the beginning – for example, my parents found it hard that they didn’t understand what Lev was saying to the boys. Still on the whole it has worked well for us, we have been lucky that the boys have always replied to Lev in Russian, I know that for many families as the kids get older, they start replying in English. What I have learned is that children’s language is incredibly fluid – a summer spent immersed in one language will often have a short-term detrimental effect on the other; one child was struggling to find the right words one year, the next he was more fluent. I have also learned that true bilingualism takes a lot of work! Since we live in an English-speaking country, and I am at home with the boys more than Lev, we found that balancing the input with Russian-speaking babysitters and films and music was critical. And as the boys get older, I find the conversations are getting more complicated and challenging – I wish I had more time for studying. But really, when we see the boys chattering away in Russian with their cousins and grandparents, that makes it all worth it. What is at the forefront of your mind when you reflect on raising boys? Many of our hopes for the boys are not gender-specific - we want them to be respectful of each other and those around them, to have their own aspirations and dreams, to be determined and resilient in the face of challenges, to be excited about the world and making a contribution to their communities. At their current ages, they love being with us and asking a million questions a day, but as they get older and enter the teenage years, we hope they continue to talk to us occasionally! More boy specific is wanting them to see both Lev and I sharing in household tasks. Marriage is, amongst other things, about finding a labor division satisfactory to both partners, and everyone has their own way of doing that. 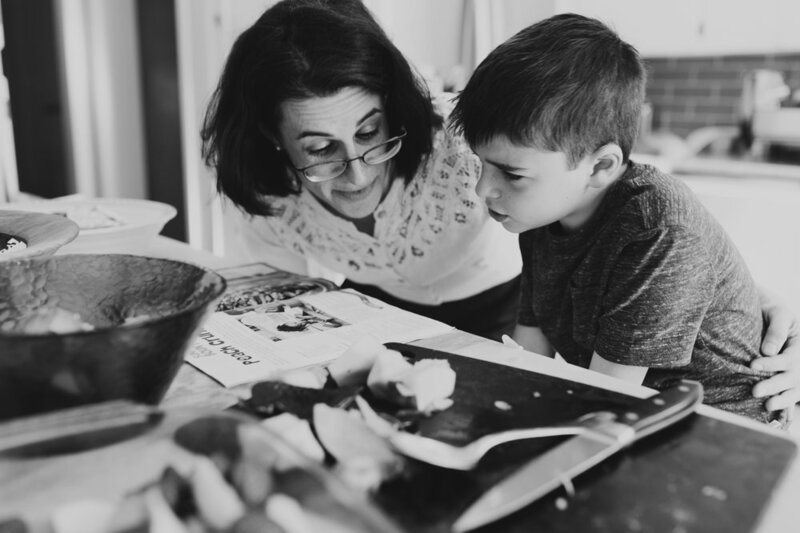 But generally, I want them to grow up thinking of housework – the tasks involved in maintaining a clean and functioning house - as the job of everyone, not just the mother. What are some things you like to do in Seattle with your boys? Music is really important to us. Lev plays the piano and the older two boys learn instruments (piano and oboe, and cello). They are now old enough to be able to come to concerts with us, and we love the Meany Center for Performing Arts, and the Seattle Opera. We also love to go to the local and national parks. The boys are at their happiest when they are outside, and Washington’s national parks and mountains have been a great way of making them feel happier about the move from Boston! If you are interested in booking an in home lifestyle family session in Seattle area, documenting your everyday, get in touch! You are co-founder and a mental health counselor at Novo Life Counseling. How did you get here? I studied Business and Communication and I worked on sales and events for Nordstrom, the Seahawks and the Sounders. I realized that I was passionate about people, their stories, and making them feel valued. Also during my time at the Seahawks, I met my husband. After dating for two years, we both felt a call to pursue a similar passion in helping people and quit our jobs and started on a new career path by pursuing graduate training in counseling psychology. God was stirring up in both of us this desire to help others navigate through their own story to find health and healing. While in graduate school, I worked simultaneously full-time at Northwest University in Development and then as the Director of Alumni and Parent Relations. I was able to create and manage events, another passion of mine, while growing and building my counseling practice. Now, four years into our private practice, Drew and I have a baby girl who is now a one-year old. We love being mental health counselors and running a business together. It’s an amazing feeling to truly love what we do. Work-life balance has evolved through different seasons in my life, especially now as a new mom. In the past, there was definitely more work than life, or more in-balance, and learning what to prioritize and have capacity for has been so important for me in maintaining that balance. As an achiever, people-pleasing, type A list maker, sometimes I need to give myself permission to take a breath, because my “do more, try harder” mentality is a great motivator, but it is not sustainable. Right now, I feel I have more of that balance. I make quality time at home with my daughter and spouse a priority. We love to travel in our 1987 Syncro Vanagon. It has enabled an adventurous lifestyle that allows for us to see parts of the backcountry and places we might not ever have explored before. It’s also amazing to meet people along the way. We typically take one month a year to travel to Baja or to explore new places, as well as a lot of weekend getaways in the van, all of which our daughter has joined us on. I will always be able to work more, but I will never get back these first years of my daughter's life. Running a business with my spouse has its challenges, but honestly I can say it has been something we really enjoy doing together. We have our own clients, and our own schedules which helps create some space, and it’s really fun to be in the office together during the days I work. We both love to be creative as well; I am in charge of interiors, event planning and marketing strategy, while Drew heads up the website and visual content. I always prioritize people and family over work, which means that I am always working towards efficiency and time management. What are some tricks that you have learned as a counselor that help you? How do you stay mindful as a multitasking business running parent? A few things: 1. Having grace for myself when things are challenging or I am not able to accomplish all of my “to-do” list. I have to remind myself that it’s okay. I make self-care a priority in my life, and have set up what I call indicators to alert me when I feel I am not being myself (i.e., I stop listening to music, or spend less time with others, or I feel my mood tends to be more negative and critical). When this happens, I know I need to pause and check-in with myself, assessing my needs. This is often met with permission I need to give myself to take the time for self-care. Whether it’s taking a walk, listening to music, jumping in the lake, spending time at my favorite thinking spot, talking to my spouse or a close friend, taking a mindful pause to check-in with myself is always needed, often times on a weekly or daily basis. It’s a way to re-charge, breathe deep, and spend time with my Creator. It feeds my soul. It is equally important to have grace for my spouse in the same way; 2. It’s okay to say “I’m sorry” first; 3. Mindful breath!!! Pausing to check-in. I like to use this phrase: Breathe in courage, exhale fear, worry, doubt, etc. ; 4. Modeling communication, forgiveness, grace, friendship, compassion, discipline, healthy relationships to our daughter and realizing that we are not going to be perfect at it, but it's enough that we do our best; 5. Practicing active listening; 6. Having regular date nights in order to maintain a healthy marriage so that we can stay connected at the times when so much of our attention is directed toward our daughter; 7. Doing family activities. ; 8. Asking for help because a strong support system and community has been so life giving for us. How you cope with demands of parenting? The best way I find myself coping with the demands of parenting is to spend time with people I love and feel supported by - my tribe. I think we all need a tribe of people who love and support us and we trust. I go to my support system for encouragement, prayer, and help even when I don’t want to ask for it, but know I need it. I have learned the importance of having a strong support system of family and friends and living life with people who are in the same season as I am. It feels comforting to know that I am not alone in this journey. I also feel it is important to make time for self-care (doing things that fuel my soul) and regular date nights. What are some of your favorite places to visit and hang out in the area? We love exploring new places, but we do have our favorites. You will always find us stopping at a local coffee shop in any town we visit, eating at our favorite Italian restaurants (Via Tribunali and Tavolata), or enjoying a craft cocktail for date night at any of the new amazing restaurants in town. I would say we also really appreciate good food shared with friends and family. A meal is always best shared with people you love. We also love being by water, so we will hang out at any park or beach in town. On the more adventurous side, some of our favorite places to visit are Hood Canal for Hama Hama oysters, the best camping views, and rest. Westport or the Olympic Peninsula for surfing and beach time. Lake Washington waterfront with a hammock and dock jumping. San Juan Islands or Vancouver Island for a long weekend getaway. We also love to travel in our van to Baja for sun and surfing with friends, and road trips to California and Bend are a must every year. To book your beach family session in Seattle, get in touch! I met Zoe when she reached out to me to photograph her first Rice & Sky collection. What an honor to work with such a talented mama entrepreneur! The collection has only launched in China, but you can get a little peek here. I visited her home recently and we chatted about raising her daughter (soon to be two daughters!) in the US, what inspires her and her current work-life balance. Tell me a little about your professional background. I’ve been interested in fashion design since childhood. My mother, who is a tailor, planted the design seed in me. When I was a child, I used to play in her studio. Sometimes she would let me try on a dress she finished. During Chinese New Year and Children's Day, my mother always made a new dress for me as a gift. She always asked for my opinion on the design. Later, she opened a paper mill in my hometown. I would visit the mill and use all the paper to make complete paper outfits for myself. My parents enrolled me in dancing and painting classes. I was not a big fan of dancing and gave up pretty quickly, but I was fascinated by painting and have loved it ever since. I applied to the China Academy of Art and majored in fashion design. This had a huge impact on my career. I started to grow quickly as a designer. After graduation, I interviewed with very good women's designer brand in China, called Exception. Thanks to the great working experience and influential designers around me, I gained a lot of invaluable experience. Four years ago, I came to the United States with my husband. After I had a baby, I became interested in baby clothes. I reached out to my college friends who had also just become a mother in China, and we founded Rice & Sky. I currently have two jobs. I work in JNBY Seattle full time. And I spend most of the evenings / nights working on Rice & Sky with my partners in China. My daughter is taken care of by my parents most of the time. I do take some time to take her for a walk in our neighborhood after dinner, get her ready for bed and read to her. After she falls asleep, I start my Rice & Sky work and connect with my Chinese partner at night. Sometimes I get up around 5 am and start working. Now that we are about to welcome our second daughter, and my older daughter will start preschool, so the schedule is likely to change. You mentioned that your daughter's play with play dough inspired your new collection. You also seem to draw a lot of inspiration from her book interests. How has your work changed since you became a parent? I’ve become much better at time management. It feels like a big achievement to be able to work and take care of a baby at the same time, which we do largely thanks to our parents who visit us and watch our daughter or take her to China year-round. Also, I learned a lot about baby’s needs, which helped me identify what the market is missing. Apparel for 0-3 years old kids is largely neglected by many companies in China due to very strict quality requirement. This, along with the deprecation of single-child policy, presented a great opportunity for us. The name of our business is also inspired by my daughter. We called her "rice" after seeing her ultrasound image. "Rice" symbolizes tiny life. "Sky" symbolizes broad and infinite possibilities. Our first collection was themed "Sprouted Seeds." and it launched in 2018. We used organic cotton, brush-painted style seed patterns as a source of inspiration. Now my daughter is two years old. She likes animals and plays with kitchen toys, which inspired me to switch focus. Why do you want your daughter to grow up in the United States? What is it that you miss about raising a family in China? I feel that no matter where my daughter grows up, she must adapt to the environment and build her own strengths, especially since she will be going to school here. I hope that she can learn more Chinese language, culture and art, and that they become more part of her identity. There are definitely different ideologies at play in child rearing. In China, most families believe baby girls should be treated as little princesses and raised in a rich environment so that they have high expectations for marriage when they grow up. Here, both girls and boys run wild, climb and bike from an early age. I like that. I think girls need to establish their goals, know what they want to pursue. We are considering providing some rock climbing experience for our daughter, which could challenge her and help cultivate a strong will. It is hard to imagine doing so for her in China. I feel that people here are closer to nature and more involved in outdoor activities. In China, people mostly focus on academics, the ranking of quiz results, every possible advantage that they can bestow onto their kids at the earliest possible time in their lives. Competition starts very early. What are your thoughts on being a working mom in the US? As a single child, I’m very surprised when I hear of American parents in our community taking care of multiple children without much help from their extended family. My husband and I are always in awe of their capabilities. It also makes us appreciate our parents who are constantly visiting us and helping us out. I feel it’s a luxury to Asian people, and it would be really hard without them. Being a working mom is not easy, especially when I need to sync with my partners in China at night after a whole day at work in Seattle. By taking shifts with my husband and, most importantly, getting help from our parents, I manage to work a lot and care for our daughter. You and your partner are both one child policy children. Now, you are expecting your second child. How has one child policy shaped your views on sibling relationships and child rearing in general? It’s interesting that our parents belong to the generation when having six or seven siblings was pretty common, while we were born under the single-child policy. To some extent, we could still compare our generation with our parents generation. Since I was the only daughter at home, my parents devoted all the care / attention / resource to me, which was hard to get in their generation, and they were very strict and had high expectations from me. In contrast, I would like to be friends with my daughter, treat her as an independent individual, give her love and care, respect her, and accompany as she grows and experience the world. I want to encourage her to explore what she wants, discover what she doesn't want and support her work. Maybe that’s reflecting the desire of our generation because we no longer need to worry about basic survival and tend to think more about what to pursuit next based on our interest. Living in the US means that our daughter won’t have many cousins to play with, so my husband are glad that she will have a sibling. I hope it also encourages team play and the spirit of sharing. As a mom, I’d like to keep marching towards my goals even with my children on the side. I want to be happy as a mother and keep curiosity and desire for new things. Photographers are pretty polarized on the use of props. While I don't typically photograph families using props, when holding sessions outside their home, I advise my clients to bring certain things with them. Meaningful items can encourage natural interaction and put adults and children at ease. Such objects achieve a dual task of making sessions more pleasant for the little ones and helping me capture a variety of images (unique expressions and detail shots). Here are a few things to keep in mind when considering props for your family session. Last spring, I took photos at a local preschool. Instead of reproducing the typical school photo 80's look, my goal was to make something fresh and deliver photos that match the quality of images I would give to my family session clients. I decided to set up a natural light studio inside one of the classrooms.